Obtenez le livre Greek: A History of the Language and its Speakers par Geoffrey Horrocks au format PDF ou EPUB. Vous pouvez lire des livres en ligne ou les enregistrer sur vos appareils. Tous les livres sont disponibles au téléchargement sans avoir à dépenser de l'argent. The only proper history of Greek from the earliest evidence up to the present day, Horrocks s book is a major achievement and fills a large scholarly and pedagogical gap. "Horrocks has outdone himself. The 1st edition was as good an overview of the entire history of Greek as there is, yet this 2nd edition improves on that, with added material on all periods of Greek. This important work is well–written, informative, and interesting." Horrocks offers an exemplary, and unique, survey of the development of the Greek language from its Mycenaean beginnings to the present day, with a particular emphasis on the reasons for Greek s linguistic conservatism. Widely read and much praised in its first edition, this expanded and revised second edition is to be recommended even more highly to all those interested in Greek of any period. 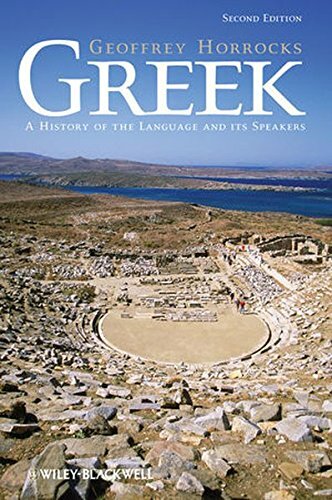 Greek: A History of the Language and its Speakers traces the trajectory of the Greek language from the Mycenaean period of the second millennium BC to the current day. Widely celebrated upon its original release, this greatly expanded Second Edition explores the evolution of the Greek language in its regional and social heterogeneity and in both its spoken and written forms. Beginning in the ancient world with the emergence and dominance of the Attic dialect in the 5th and 4th centuries BC, the book goes on to examine the subsequent development of the language during the Hellenistic and Roman periods. The text explores the tension between written varieties and evolving forms of the vernacular and the resultant 2000 years of diglossia –– the ever–growing gulf between what was said and what was written, and the linguistic consequences. Other topics addressed include the ancient Greek dialects, epigraphic and literary; the impact of the adoption of Greek by the Macedonians, Romans, and as a lingua franca in the East; the role of Greek in the development of Latin and modern European languages; and the position of different forms of Greek in the medieval Byzantine state. Finally, more recent problems of establishing a standard language and education system in the independent Greek state that emerged in the early 19th century are revealed, as well as the ongoing legacy of diglossia into the 1970s. Unmatched in breadth of material and scholarly rigor, Greek: A History of the Language and its Speakers, Second Edition, remains the essential resource on the development of the Greek language.